US residents eager to get their hands on Sony's XEL-1 may have to wait since Sony is only taking pre-orders in Japan. 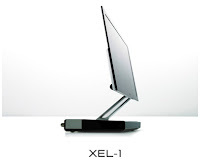 The XEL-1 is Sony's first OLED TV which has a 960 x 540 resolution and a contrast of 1,000,000:1. Sony's XEL-1 has only an 11 inch screen only 3mm thick and has and will be available in the Japanese market starting Dec. 1. So what's the big deal about the XEL-1 and OLED display? Well some say that OLED display may well take over LCD TVs. OLED is made up of organic compounds and unlike tradition LCD TVs, it does not require backlight to function so they require less power. The Sony XEL-1 will cost around 200,000 Yen or $1,800.